All the aspirants who have successfully applied for SSC Constable GD online application can now download the SSC Constable GD Admit Card 2018-19 from the regional websites of Staff Selection Commission. The SSC Constable GD Admit Card got released on 4th February 2019. Candidates can check the regions and their official websites from this article. Aspirants must know that the SSC Constable GD Admit Card 2018-19 will not be sent to them by post. Candidates will be able to download their SSC Constable GD Admit Card 2018-19 by entering their registration number and date of birth. 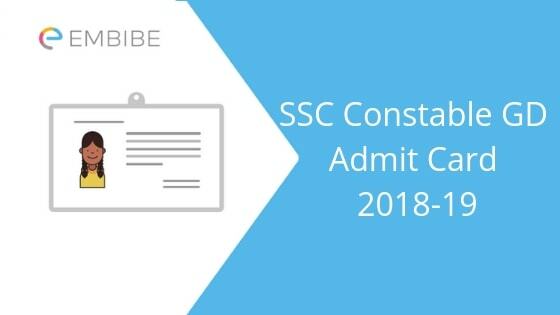 In this article, we have updated detailed information related to the SSC Constable GD Admit Card 2018-19. Step -2 Go to Admit Card tab. A list of regional websites will be opened. Step -6 Enter necessary details, Application number, and date of birth. Step -9 Download the SSC Constable GD Admit Card and take a print out. Candidate must carry following documents with them at the time of examination along with the Hall Ticket. We hope this detailed article on SSC Constable GD Admit Card 2018-19 helps you. If you have any query pertaining to SSC Constable GD Admit Card 2018-19 or exam in general feel free to post your comments below. We will get back to you at the earliest. Hey Tulsi, how may I help you? You can click on to the official website, ssc.nic.in and follow the steps mentioned in the above article for downloading the admit card. You will be able to download it with ease. No, knowing only the password but not the username will not help you in any way. I hope that you remember your email ID or mobile number so that you can reset your password using that. You need to go to the official website and click on the “Forget Password” link and then an OTP along with your user id will be sent to your email ID/mobile number. Enter the OTP and then set a new password. The admit card for SSC GD has been released today. You can download now. The admit cards will be available online on the official website as per your region. Follow the steps mentioned in the article to download the same. Hey Monika, what is it saying, exactly? Please check your registered email ID or phone number. It should be there. Hey, what is it saying exactly? Hey Mushtaq, screen mein kya message display ho rahi hai? Rakesh aapko usi link se admit card milega. Aap mujhe apna region batao taaki main aapko admit card ki direct link de paaun. May I know your region Gobind? Moirangthem can you please help me with your region? Hi Chunnu Shaw, Kindly contact the officials for this matter. To download your SSC GD Admit card, you can use this direct link http://sscner.org.in/2/GD18. There must be some error in your application form. Please contact the official authorities regarding the same. Please contact the official authorities regarding the same. It seems like a technical error. No the exam dates are not postponded. It’s our pleasure helping you! The results are expected to release in the month of May 2019.